To make an appointment call us on 9404 1133 or book online. 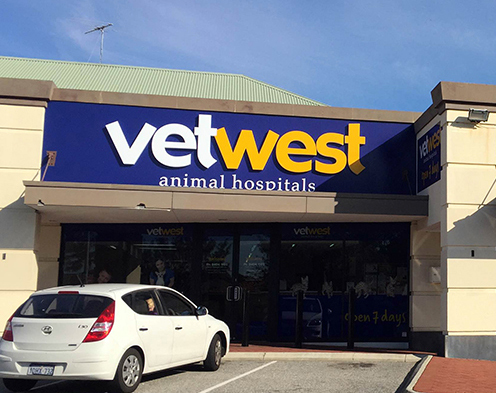 Vetwest Whitfords is located at Unit 6, 37 Endeavour Road, Hillarys 6025. We are located just a 5 minute walk from Whitford City Shopping Centre and 5.3km from the famous Hillarys Boat Harbour, the first major marina built in the northern region of Perth. The boat harbour includes the popular café and restaurant boardwalk and a sheltered and sandy inlet perfect as a relaxed swimming destination for families. The coastal suburb of Hillarys is located 21km north of Perth and 9.2km north of the nearest train station in Warwick and is an iconic part of the Western Australian culture. With its beautiful beaches and parks, Hillarys embodies typical life in WA and the local community is active, friendly and warm. Located just behind Whitfords City Shopping Centre, we are situated in a separate complex with ample parking right in front of our veterinary hospital. We are in the same area as Bunnings Warehouse, City Farmers, Jetts Gym, and Chipmunks play centre. Our team welcomes all pets not only from Hillarys but from the suburbs of Kallaroo, Craigie, Padbury, Sorrento, Duncraig, Kingsley, Woodvale, Beldon, Mullaloo, Edgewater and Heathridge. For your convenience, our opening hours for Monday to Friday are 7:30am to 7pm, perfect for before or after work appointments. We are also open from 8am until 5pm on Saturdays, Sundays and most public holidays - giving you more opportunity to book in an appointment time that works for your schedule. If you are ever concerned about the health of your pet please do not hesitate to contact us, not matter how big or small your question may seem. Be sure to call Vetwest Whitfords today to schedule your next appointment – we look forward to meeting you and your pet!